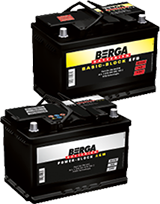 With more than 80 years of tradition, Berga batteries are an excellent example of a first-class product that has expanded in leaps and bounds. By the late 1920s, Berga engineers were already ensuring people’s mobility. More and more people were discovering the advantages of having a car, and the rechargeable batteries from the small southern German town of Rastatt were often their first choice. In addition to batteries for passenger cars, Berga also manufactured batteries for telegraph, telephone and signalling systems, as well as smaller railway engines, and sold them through an extensive retailer network. More and more knowledge went into developing smaller, lighter and more powerful batteries, so that in the 1960s, the company was advertising them as being “brand-new from the Black Forest” – instantly ready to use and completely “winter-proof”. At that time, dry, fully charged batteries were the cutting-edge of technology and, of course, Berga was at the forefront of this development. The idea behind the advertisement from the 1970s, which encouraged consumers to power their barbecues with a Berga safety battery, documented the company’s trust in the power and reliability of its own products. Since the 90s, it goes without saying that Berga has expanded its range to include filled and charged batteries for passenger cars that are exceptionally simple to install and maintain. The new, completely maintenance-free batteries for commercial vehicles represent the next step in making the installation and servicing of batteries as simple as possible. developing the trends of tomorrow, to protect the Earth’s resources and ensure a sustainable environment. Our engineers are working on maintaining Berga’s leading edge and its batteries’ legendary reputation as German masterpieces.